Most Wednesday afternoons are highlighted by a trip to the farmers market. The kids and I stroll around exploring the various offerings of the day. We are greeted by the young man who sells the sweetest strawberries, stop to try a handful of roasted peanuts, say hello to the old woman who sells eggs, and listen to the flute musician adorned in a colorful robe who only seems to play one melody on repeat. It is a uniquely communal, earthy experience in the heart of our urban Los Angeles neighborhood. Depending on what catches our eyes, we might pick out a bunch of kale, a bag of oranges, several crisp apples, or try something new and bold like golden beets. These weekly farmers market excursions remind us of the beautiful simplicity of food, and give us a chance to be more connected to the people who produce the things we eat. Here are stuffed peppers that use many fresh ingredients found at our farmers market – onions, garlic, parsley, and of course, bell peppers. Red peppers are my favorite, mostly for their sweet taste and vibrant color. 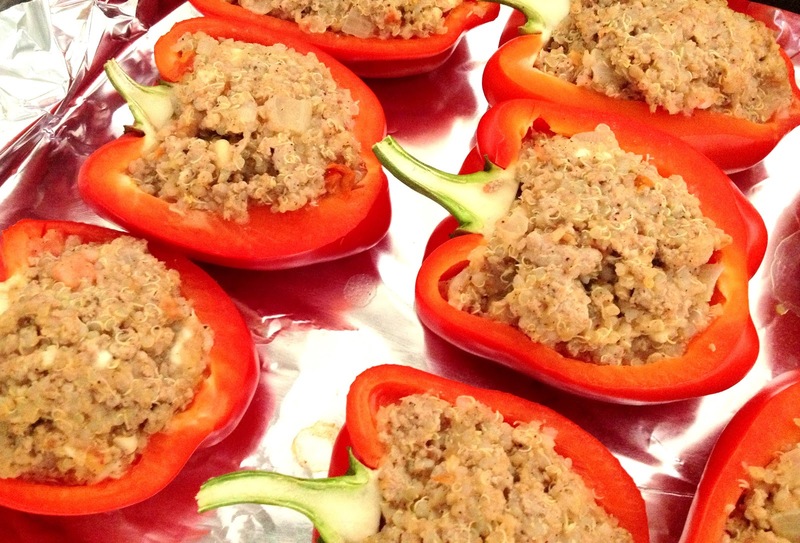 The peppers are stuffed with a blend of quinoa, ground turkey, and feta cheese. 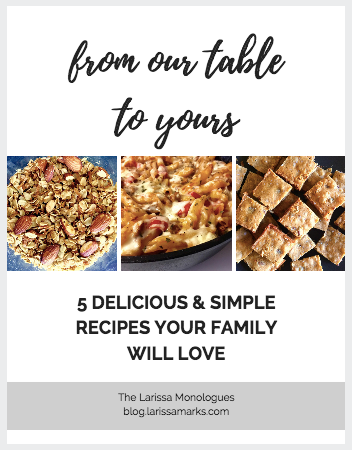 They are both elegant and simple, and make lovely leftovers. Rinse quinoa in a fine-mesh sieve under cold running water. In a medium pot, combine quinoa with 1 1/2 cups water. Bring it to a boil, then cover and turn heat down to low. Simmer for 15 minutes. Remove from the heat. Fluff with a fork and set aside. Cut each pepper in half lengthwise from stem to bottom. With a sharp paring knife and your fingers, trim out the ribs and seeds until the pepper is clean inside. Heat oil in a medium sauté pan or skillet over medium heat. Add the onion and cook, stirring, until it is soft and translucent. Add the garlic and cook 1 minute, stirring. Add the turkey, cumin, salt and pepper. Cook, stirring to break up the turkey, until the pink is just gone. Stir in the tomatoes with their juice, feta and quinoa. Fill peppers firmly with the turkey-quinoa mixture. Mound it a little on top. Place peppers in a shallow casserole or baking dish, cover with foil and bake at 350 degrees for about 35-40 minutes.